As French starlet Mamadou Sakho continues to make his unhappiness with his current situation at PSG clear, we explain why he is Les Parisiens’ most prized possession. How well have PSG really done this season? Currently still in the running for the Champions League, Coupe de France and Ligue 1 titles, simplistically speaking, Les Parisiens are therefore on track. Key to their apparent success? Heavy investment. Only 4 of the 11 that started against Saint-Etienne in their latest Ligue 1 game played a regular part in PSG’s team last season (Matuidi, Sirigu, Pastore + Maxwell). The marquee signings of Ibrahimovic, Lavezzi and Thiago Silva certainly caught the footballing world’s eyes in summer and there is no doubt about their influence on results this season. However, with the UEFA Financial Fair Play regulations set to become active imminently, there is no way PSG will be allowed to spend so magnificently in the future. From a marketing perspective, last summer’s aggressive spending, has ironically won the club fans from all over the world. In France, PSG are actually only the 3rd most supported club behind Lyon and Marseille, a recent L’Equipe poll concluded. In terms of social media, PSG are also still lagging behind rivals Marseille. OM have 555k followers on Twitter compared with PSG’s 490k. However, on Facebook, the gap is much closer, with PSG accumulating 2.2 million likes’ on its official page compared with Marseille’s 2.3 million. Yet other statistics tell a different story. PSG’s growth in support this year is actually 12 times greater that Marseille’s this season if you look at the amount of support on social media sites this time last year. It is not unlikely that PSG will eclipse the amount of support OM receive come the beginning of next season. Therefore, it is clear that the arrival of big names over the past 12 months has increased the amount of support for PSG worldwide, increasing turnover through merchandise in the process. There is however a flip side to their achievements. UEFA and the LFP want to see a greater emphasis placed on nurturing French talent rather than spending big on players from top European clubs. It is not only the footballing body’s who are worried. Football fans across the globe are catching on to this rather brutish way of running a football club, a perfect example being the waning support of Manchester City in recent months, as the initial attraction seems to have washed off. PSG must build sustainably and responsibly in order to gain a better worldwide reputation and so that they can set an example to the rest of Ligue 1. The current squad really does lack depth. In the summer, Le Crom, Camara, Bodmer and Mohammed Sissoko will leave, with Chantome likely to do the same. Les Parisiens must find a way to replace these players with quality, but without greatly disrupting the apparent squad hierarchy in place. How do they do that? By buying young French talent which they can nurture to eventually become long-term replacements for the Thiago Silva’s and Zlatan Ibrahimovic’s of this current squad. This is why 23 year old centre-back Mamadou Sakho is currently their greatest asset. He is the only player who currently fits that bill. 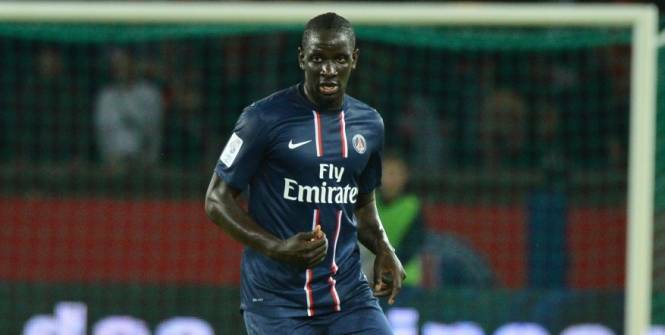 Arguably, he is the best French centre-back right now yet he can hardly get a run of games for PSG. Why? Ancelotti is disinclined to drop his old favourite Alex, and no one would dare demote Thiago Silva. Either way, Sakho is rightly frustrated. The irony of the situation is, that bar the game vs Georgia this month, Sakho had played every single game for Didier Deschamps for the France national team despite the obvious lack of first team football for his club. In the current starting XI, when PSG have a fully fit squad, just one Frenchman has been regularly able to keep his place this season: Blaise Matuidi. Is this team even French? QSI must catch onto this quickly as they prepare to strategise for the summer transfer window. Yes, they will without doubt in some cases have to overpay, for fellow Ligue 1 sides to let their prized possessions go; yet it is worth it in the long run. Yes, Les Parisiens have intelligently used the funds available to them thus far, but they must accept that they are now entering into a new phase of development where they must create the platform on which to build. Sakho is the beacon of this potential wave of young French talent which could be bred by PSG, and, if they fail to appease the centre-back in the coming weeks with promises of game time and a clarification of his role at the club, then it is likely to deter other ‘Espoirs’ from signing if they are unlikely to get a sufficient chance to play. In order for PSG to be successful across Europe for years to come, the first step in the right direction is succumbing to one very talented centre-back’s demands.